Laura Bach Buzzell and Peter Clark are a father and daughter attempting reconciliation in David Mamet's "Reunion," one of a pair of one-act plays being presented by the Actors Group. At times, theater is best presented in a small space. The Actors Group production of David Mamet's "Reunion" is a good example. 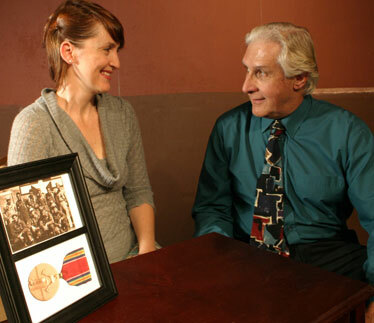 Watching veteran actors Peter Clark and Laura Bach Buzzell work through Mamet's one-act vignette about a ex-alcoholic war vet trying to find common ground with the daughter he abandoned 20 years earlier is an experience best enjoyed at close range. TAG's little "black box" space, barely the size of an average living room, is a perfect place. "Two One-Act Plays," presented by the Actors Group, continues at 7:30 p.m. Thursdays through Saturdays and 4 p.m. Sundays, through July 13, at Yellow Brick Theatre, 625 Keawe St. Tickets are $15. Call 722-6941 or visit www.taghawaii.net. The premise is simple enough: Bernie (Clark), a functioning alcoholic for much of his adult life, abandoned his first wife and their daughter, Carol (Buzzell), when the little girl was 4. Bernie is now on the wagon, and Carol and her husband have found him through Alcoholics Anonymous. She comes to his apartment for a face-to-face meeting. The situation could be written and played many ways, but Mamet opts for realism. Clark and Buzzell play it perfectly. Bernie is earnest in wanting to reconcile with his daughter but also is understandably defensive about his past. Carol wants to understand her father and some of the choices he made, but at the same time has a lot of forgiving to do. Clark, one of local theater's underutilized actors for years, develops Bernie into a likable, albeit flawed, guy whom most of us would probably welcome as a friend, if not, perhaps, as a prodigal parent. A slight shift in the position of his eyebrows or the tone of his voice is all Clark needs to show us Bernie's emotions at work as he tries to explain himself -- to himself as well as to his daughter. Buzzell's expressive performance likewise shows Carol attempting to process all this new information, make sense of her father's life and decide whether she is ready to commit to their budding relationship. Mamet tells the story as a series of excerpts from a much longer conversation. Each snippet increases our emotional investment in the outcome. Buzzell returns after intermission to play a secondary character in Harold Pinter's far more surrealistic piece, "A Kind of Alaska," in which a woman, Deborah (Hoku Gilbert), regains consciousness after 29 years of comalike "sleep." "I'm here to take care of you," a mysterious bearded man assures Deborah as she regains consciousness. "They all say that," she replies tartly, unaware at first that she is no longer the flirtatious upper-class 16-year-old English girl who "went to sleep" almost three decades ago. The mysterious man, Dr. Hornby (John Wythe White), also is apparently her brother-in-law. Deborah doesn't recognize him, of course, nor does she believe that the 40-something woman who comes to see her is her sister Pauline (Buzzell). The scenario sounds like an episode from "The Twilight Zone" or "Outer Limits," but White explains in the program notes that it is based on a epidemic of "sleeping sickness" that swept Europe in the winter of 1916-17. Symptoms included mania, trances and deep sleep. In either context, it makes for a horrifying premise but entertaining theater. Gilbert wears the character of an amoral mental patient like a second skin or an alter ego -- the expansive spectrum of emotions she creates with her expressive eyes are a show in and of themselves. White, who will always be remembered as the star of TAG's production of "The Goat, or Who Is Sylvia?" in 2006, supports Gilbert's performance effectively in the major supporting role. Buzzell does her bit nicely in that department as well. David and Loren K.D. Farmer bring husband-and-wife teamwork to the double bill as director and assistant director, respectively. They also share credit as co-designers of the set and for choosing the audio tracks that add to the dramatic ambience of the evening.